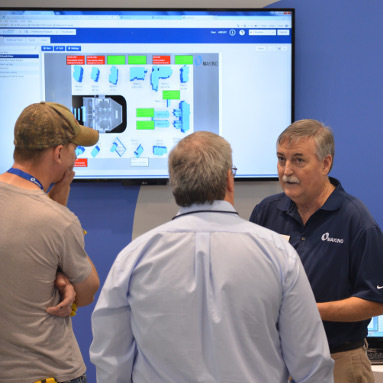 The International Manufacturing Technology Show (IMTS) proved again to be the place to discover the latest machining and engineering solutions for aerospace manufacturing. With 115,612 attendees and a record 2,407 exhibiting companies, IMTS offered plenty to see, hear and learn. Hot topics covered in the South Hall included presentations about machine automation and the Industrial Internet of Things (IIoT). That’s not a surprise given the relentless demands to reduce costs in today’s hypercompetitive global markets and shortages of skilled labor facing North American manufacturers. 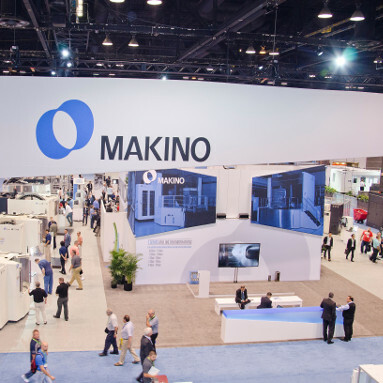 Makino led the conversation, with 11 of its 16 machines on display integrated with automation ranging from simple pallet pool systems to complex, custom-engineered aerospace manufacturing systems. Our engineers and representatives also shared insights on how the IIoT is transforming aerospace manufacturing. And we made news, introducing ProNetConneX, which provides the data and connectivity necessary to rapidly respond to fluctuating market demands. IMTS 2016 likely will be remembered as the show and the year when automation became a critical approach for North American manufacturers of all sizes and backgrounds to successfully compete globally. Automation has long been viewed as a way for larger companies to reduce costs and increase throughput; however, this year’s show floor highlighted a number of automated solutions that shops of any size can embrace. 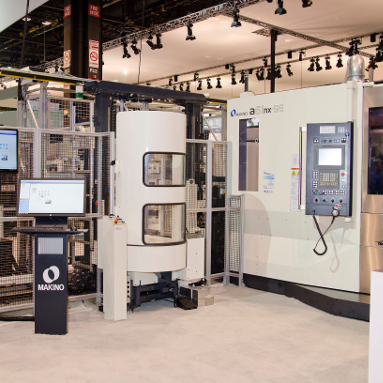 Machine tool makers and robotics suppliers demonstrated a wide variety of automation solutions, from in-machine tool monitoring and hydraulic fixturing to single-machine-tending robot cells and rail-guided robotic material handling systems. IMTS 2016 clearly demonstrated that there is a viable and valuable automation solution for the incredibly high-mix, low-volume processing requirements of the aerospace manufacturing market. At the Makino booth, show goers were presented with one of the largest and most diverse automation catalogues of any booth this year. These key systems included a linear pallet systems with a 5-axis horizontal machining center for aluminum structural parts, a 5-axis vertical machining with integrated work pallet magazine, a hybrid laser and EDM process for the production of cooling holes and diffuser shapes in aerospace blade and vane components, and more. Across eight unique systems, Makino demonstrated how automation can be implemented to support any shop environment with a little human ingenuity. Throughout the exhibit halls at McCormick Place in Chicago, machine tool and control software suppliers touted how they plan to integrate the Industrial Internet of Things (IIoT) solutions to collect and analyze operational data. MTConnect clearly has emerged as the industry standard for manufacturing communications and interoperability between manufacturing devices and software. Most machine tool suppliers emphasized basic real-time reporting capabilities of their IIoT solutions, including app-based dashboards that make spindle speed, cutting time and other live status updates available to operators on their computers as well as smartphones or tablets. Some exhibitors hinted at future IIoT capabilities to not only harvest data from the shop floor but to analyze it in real time to inform business decisions. Every facet of a company’s operations can be transformed by IIoT applications that predict maintenance needs, tool life or cutter failure, and assist owners with decision making. This robust functionality is the promise of IIoT, but not yet the reality for nearly all of the exhibitors at IMTS 2016. Look for the next versions of IIoT products and services to feature predictive software, especially for machine maintenance. That’s the direction chosen by Makino, which unveiled ProNetConneX, a machine interface that connects, collects and analyzes machine data within the intelligent factory network for ultimate productivity and efficiency. ProNetConneX offers manufacturers a built-in, instant on-ramp to the IIoT, with secure connectivity to today’s leading software management systems via MTConnect. “As we continue to develop the technology, ProNetConneX also will equip companies with holistic knowledge and control of their manufacturing operations, from monitoring of machine status and utilization to enterprise resource planning (ERP) system integration,” said James Brown, manager of controls software development at Makino. Among the metal cutting exhibitors, many manufacturers showed off their 5-axis technology to meet the complex geometries of parts and molds. The advantages of 5-axis machining significantly improve productivity and profitability. Five sides of a part can be processed in a single setup. This yields shorter lead times and better accuracy. Workpieces no longer have to be moved across multiple workstations or other machines for additional processing. Perhaps the biggest advantages to 5-axis machining, however, are the advanced capabilities to produce ever-more complex designs. Once seen as only appropriate for production of the biggest parts, 5-axis machines provide companies with greater precision and productivity across a range of industries and applications. 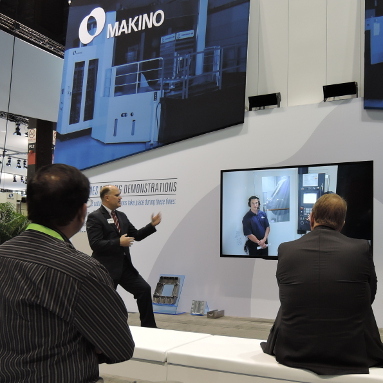 Throughout the week, Makino’s aerospace theater streamed live video feeds from Mason, Ohio, of our T-series 5-axis horizontal machining centers built for titanium aerospace machining. At the show, we highlighted an a61nx-5E integrated within an updated MMC2 linear pallet system. The system showcased the fixture plate distribution capabilities of the updated pallet system, and demonstrated highly productive metal removal and machine utilization rates for small to mid-sized aluminum structural components. 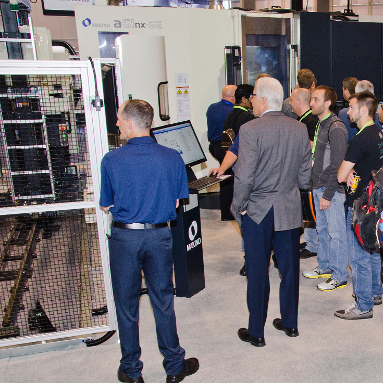 Attendees also had a special opportunity to be the first to see live-action demonstrations of the new DA300 5-axis vertical machining centers. 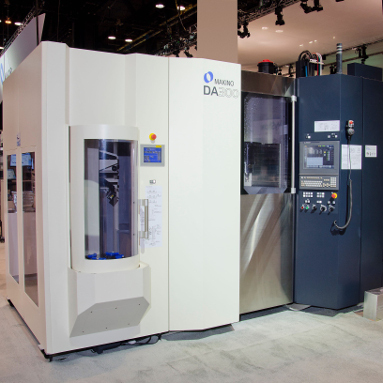 Together, these technologies demonstrated the growing number of purpose-built 5-axis machining centers to meet the specific challenges of aerospace suppliers. Many aerospace suppliers are challenged by shortages of skilled labor and the looming retirements of baby boomer operators. As a result, machine technologies are evolving with new control solutions that simplify programming and setup operations. Many machine suppliers at IMTS demonstrated intuitive controls featuring touchscreens operated with gestures similar to familiar consumer products such as smartphones. Today’s advanced controls move operators of all skill levels fluidly through machine set up, empower them with easily accessible information, and protect them with enhanced safety. Importantly, the control interfaces are similar to the consumer products that younger workers have grown up with, easing their move into operator roles. As seen from Makino’s latest controls, user-friendliness has been enhanced with features such as onboard digital manuals, intelligent help functions, and e-learning training systems which empower operators with practical support tools to boost machine productivity. All machining centers demonstrated in Makino’s booth were equipped with the Pro6 control for horizontal and vertical machining centers or the Hyper-i control for sinker, wire and drilling EDM machines. These controls have been specifically designed to accelerate productivity for machine shops with streamlined screen layouts, operator guidance and the latest machine functions. The Hyper-i control in particular offers pinch, swipe and spread functions that give the operator a simple, efficient and natural feel on a 24-inch touchscreen.